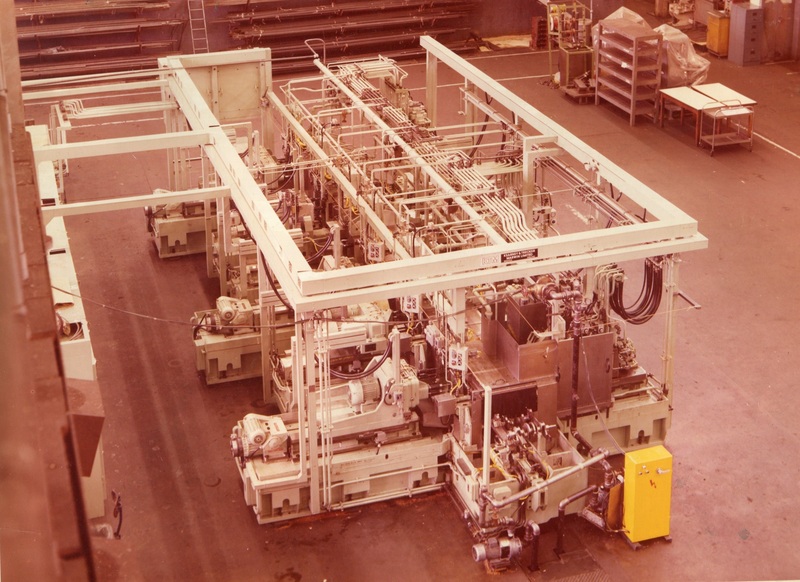 While the early 1970’s were a difficult times, where the workforce were downsized, the manufacture of huge Special Purpose In-line Transfer Machines, for both the home and export markets became more common. 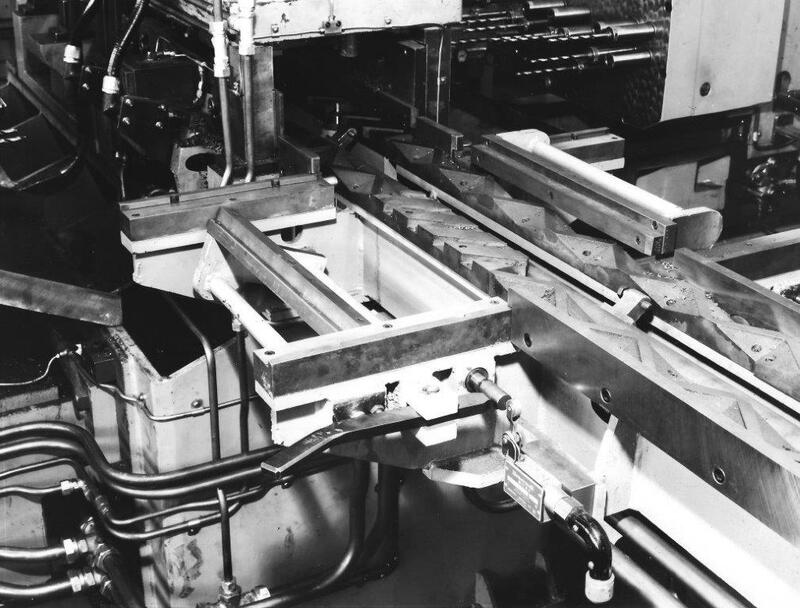 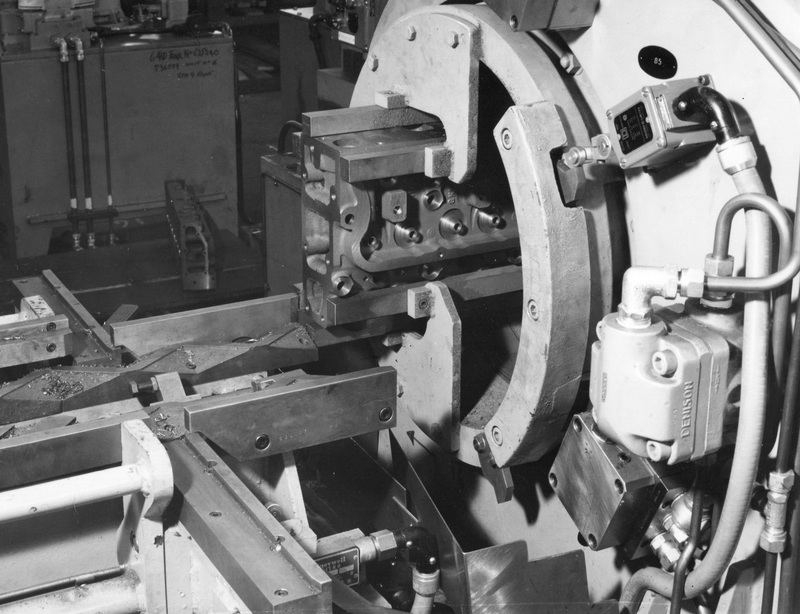 These “in-line” machines incorporated multiple workstations arranged in a line either side of a track on which the components were moved progressively to each station. 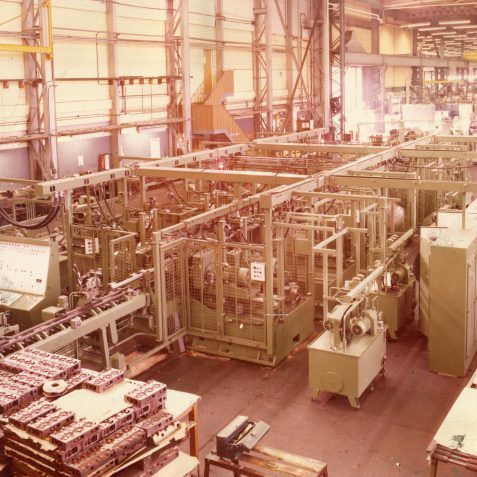 Although the Hollingbury factory was 28,000 square metres, some in-line transfer machines were too long to build “in-line” in the factory. 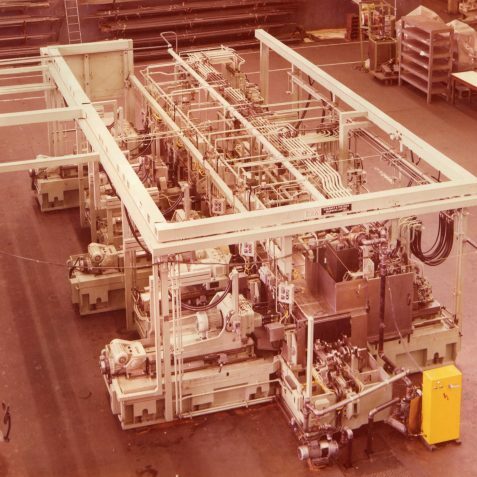 In this case, the machine was built in manageable sections, and only fully in-line when installed at the customer’s factory. 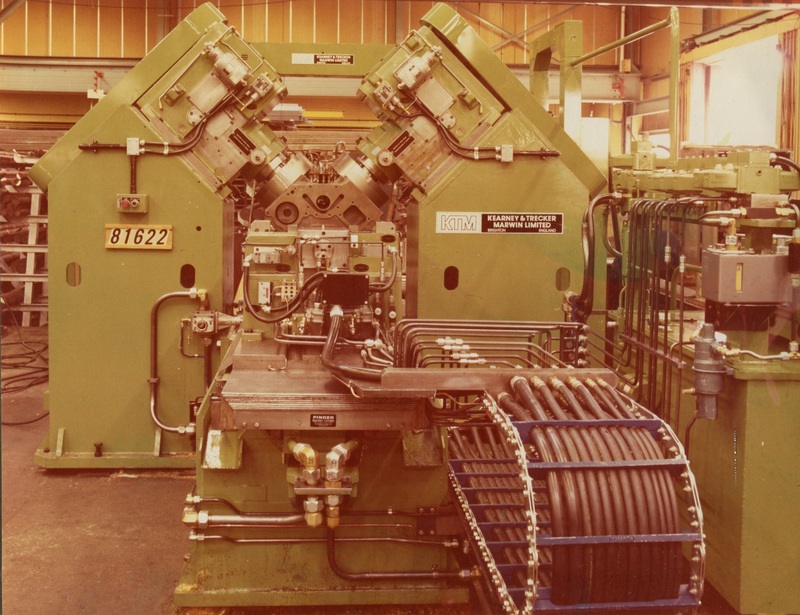 There were 2 types of transfer; firstly Platten Transfer where the component is clamped to a workholding fixture, and both the fixture and component are transferred through the machine, stopping at each station to be machined. 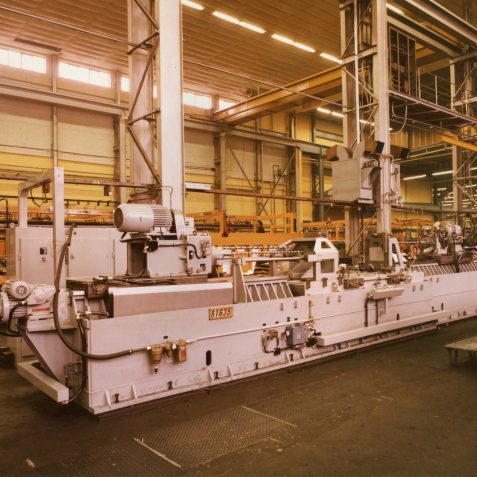 Platten or Pallet transfer method has a number of disadvantages, cost being the most significant. 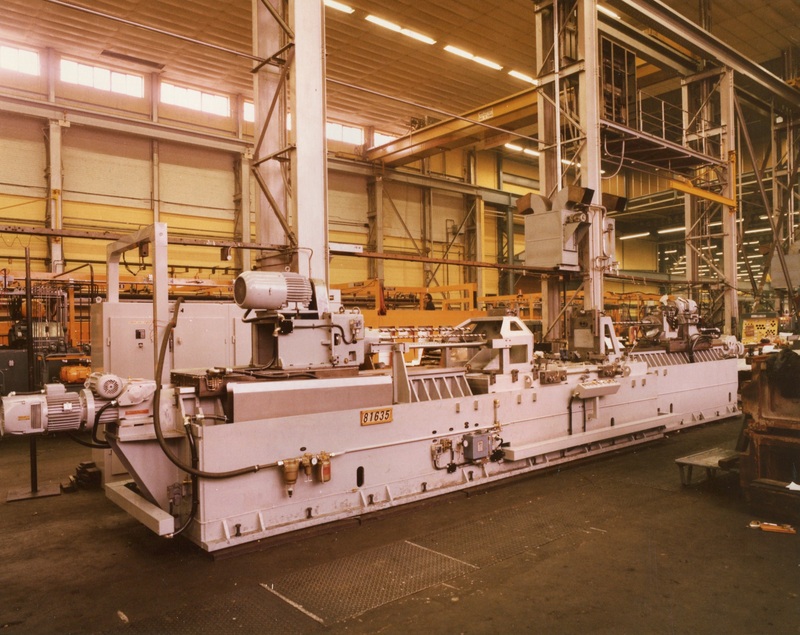 The second method; Free Transfer, where the component is transferred in a free state through the machine. 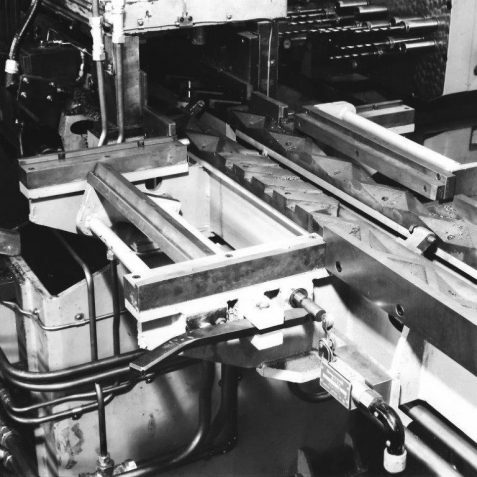 With Free Transfer there were 2 main types of systems used to move the components, firstly the “Skid Transfer” method, where a transfer bar would rotate and engage trapping fingers, the transfer bar would then move and slide the components along hardened rails. 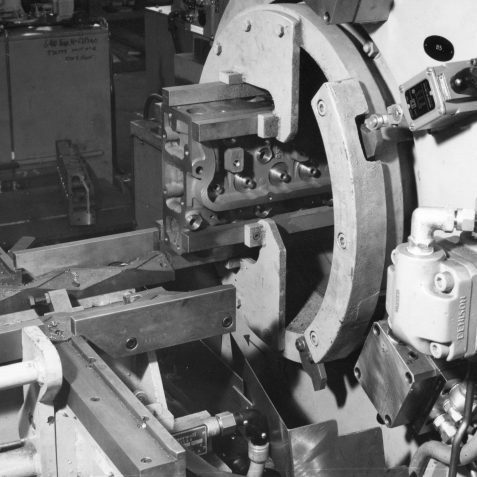 Secondly, a “Lift and Carry” method, where bell cranks would lift the component up off the work-holding fixture, and move and lower it onto the next fixture. 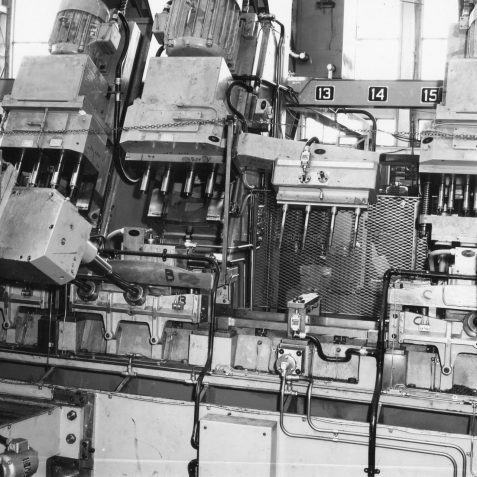 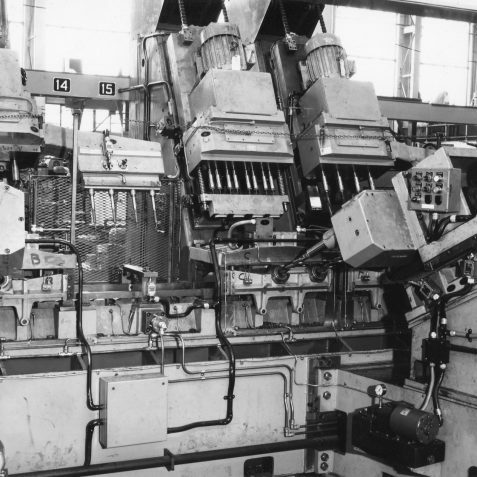 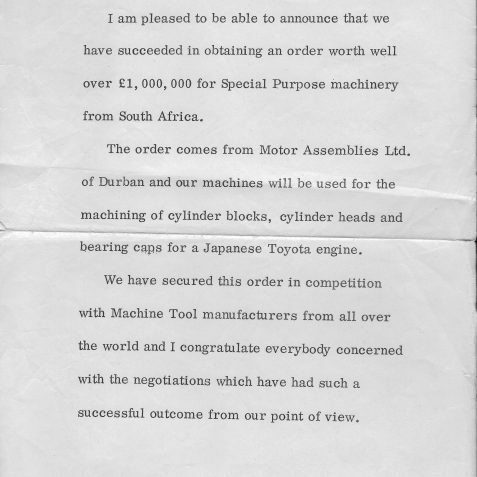 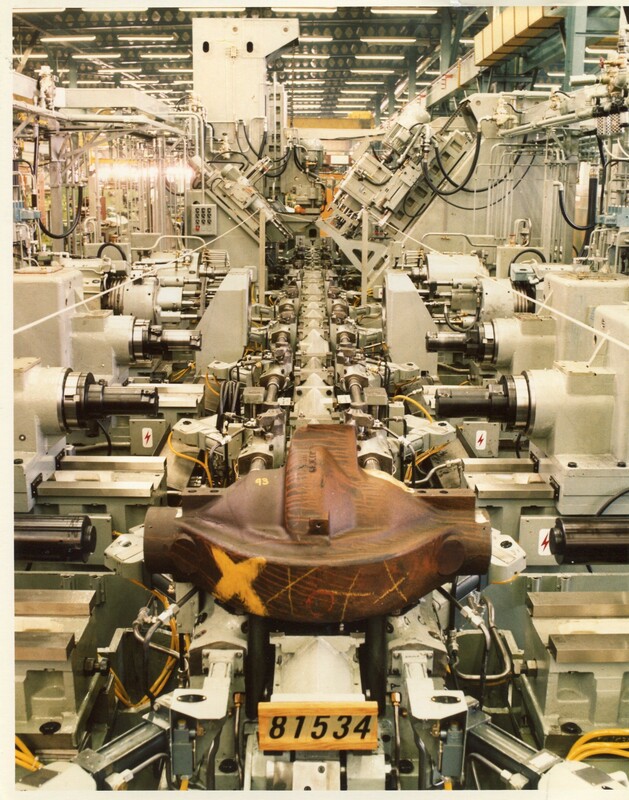 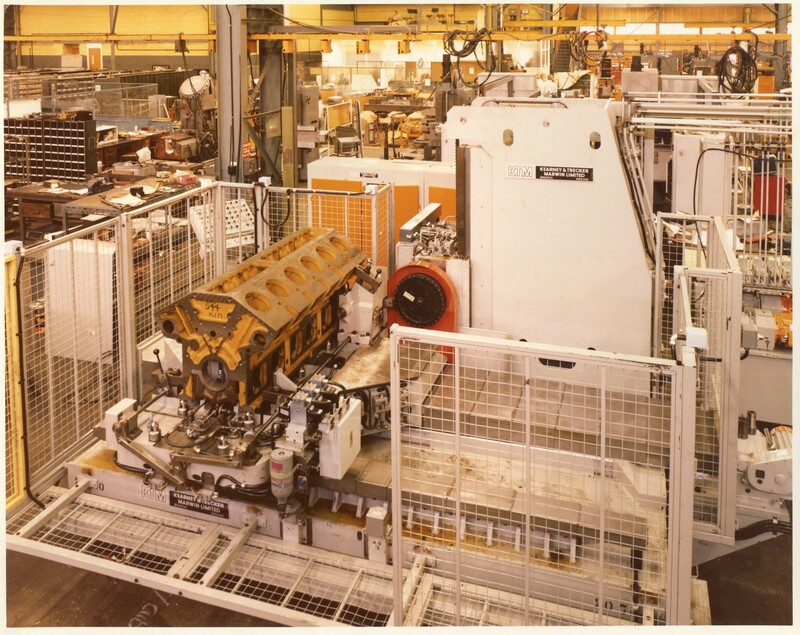 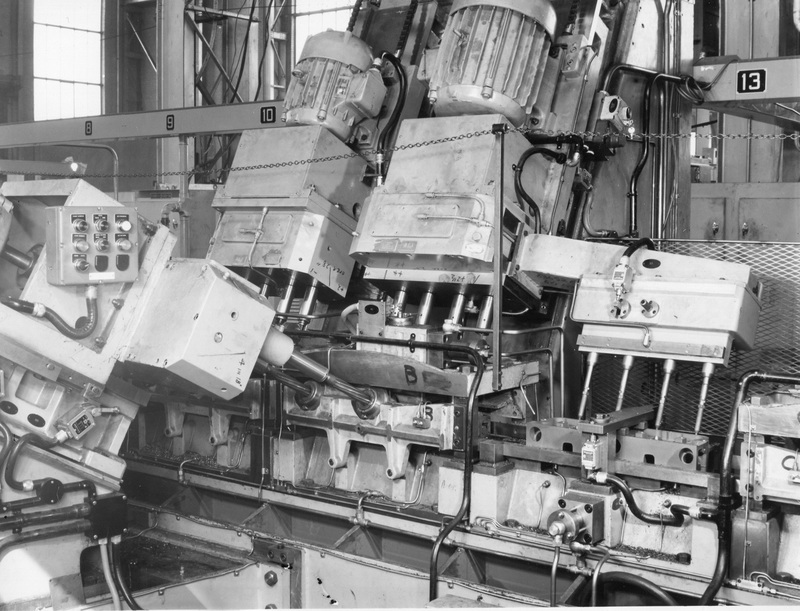 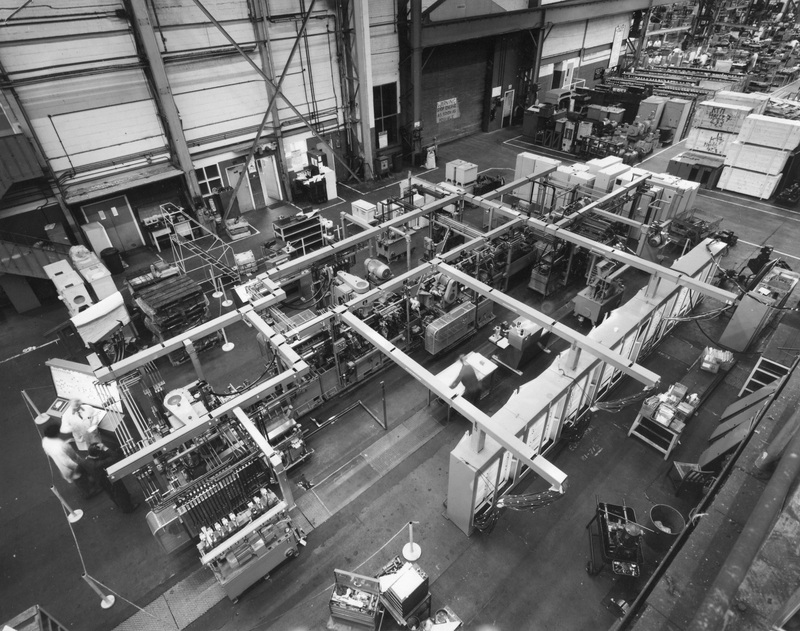 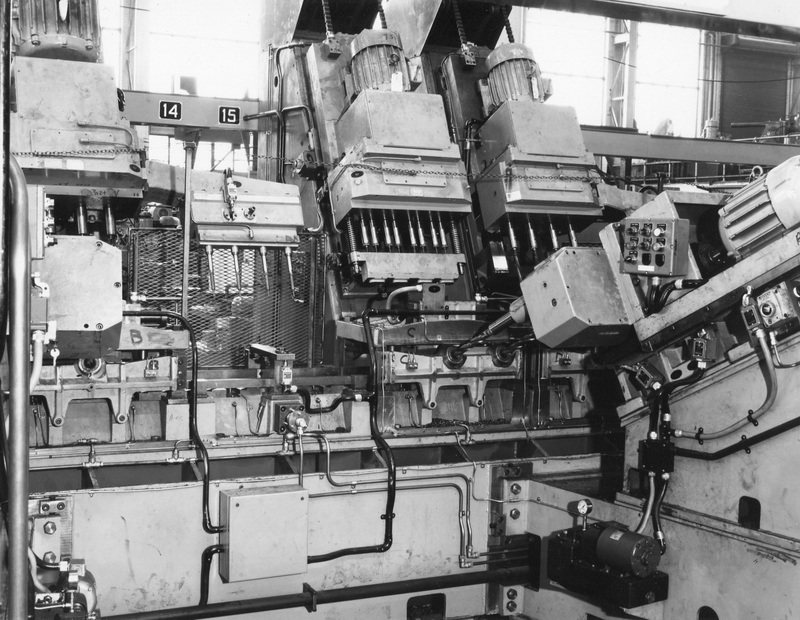 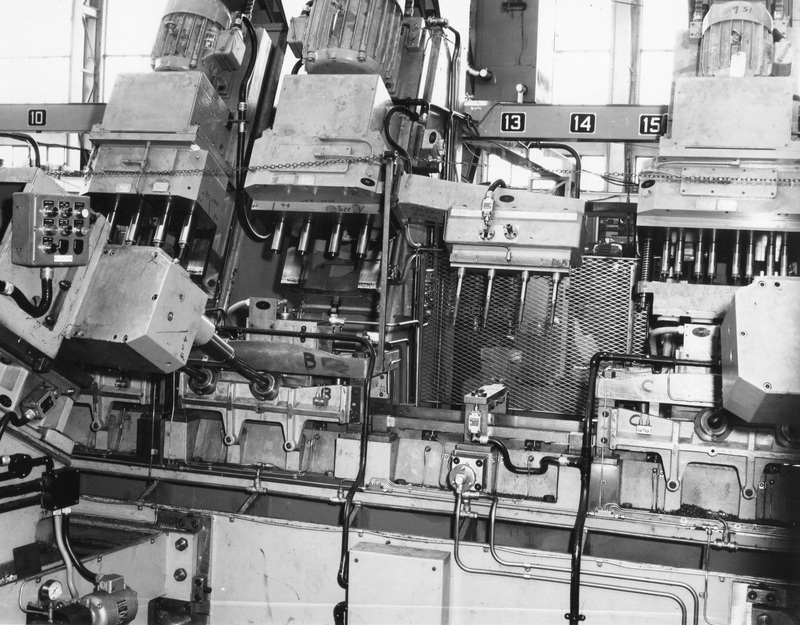 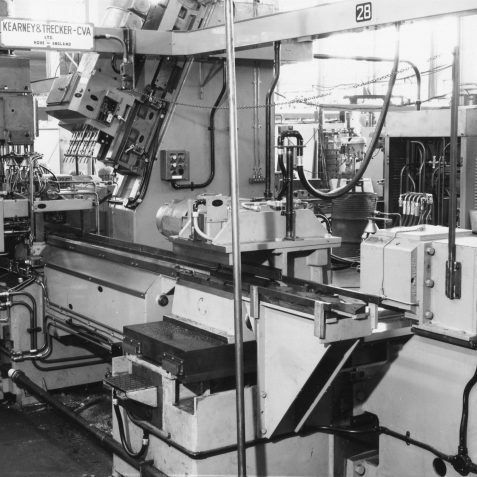 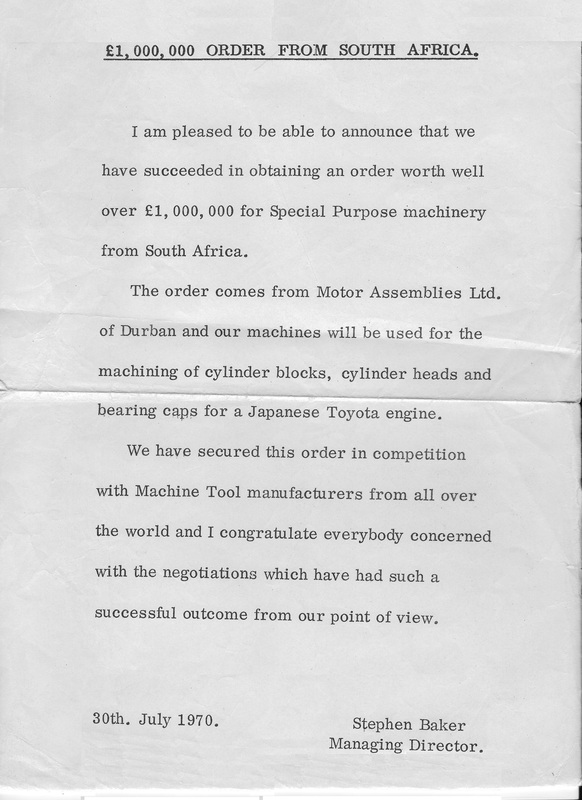 In July 1970, a £1m order from Motor Assemblies of Durban South Africa was announced, for Special Purpose Machines for the production of the cylinder blocks, cylinder heads and bearing caps for the Toyota engine. 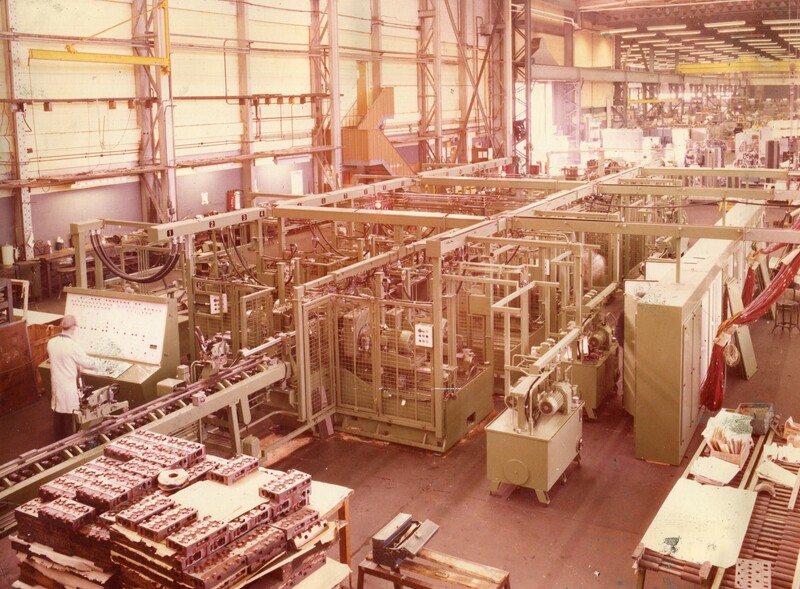 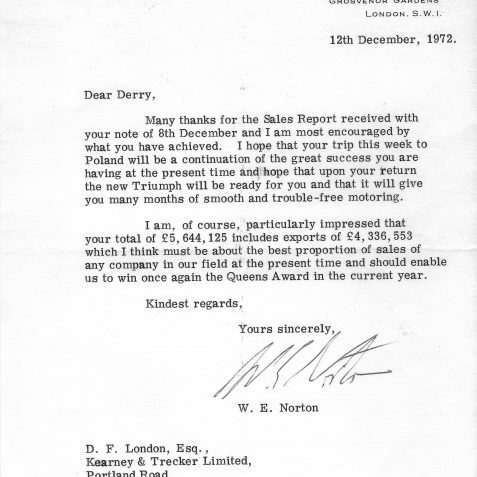 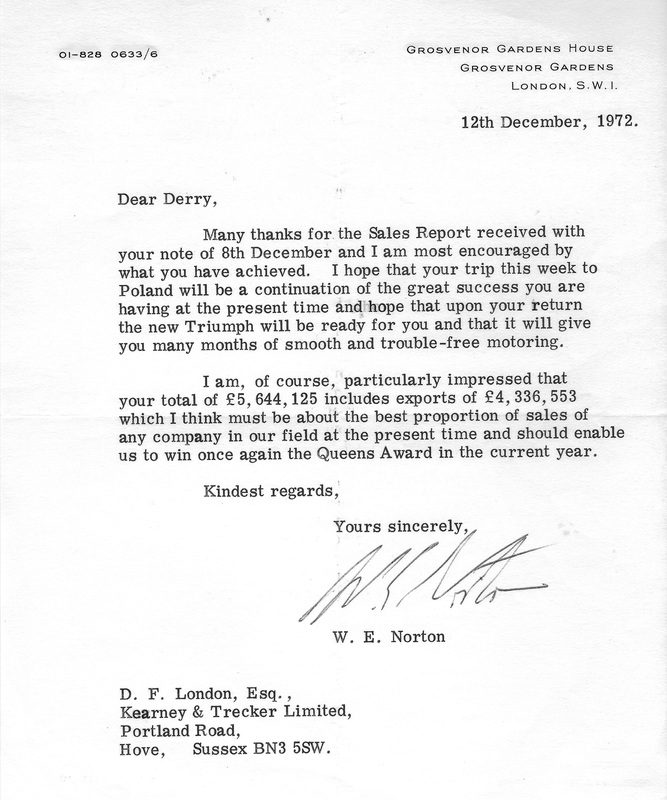 In November 1971, an order for £1.1m was announced for one 17 station Transfer Machine, one 29 station Transfer Machine, two 6 station Transfer Machines and two Unit Machines, for installation at the RABA works in Gyor Hungary. 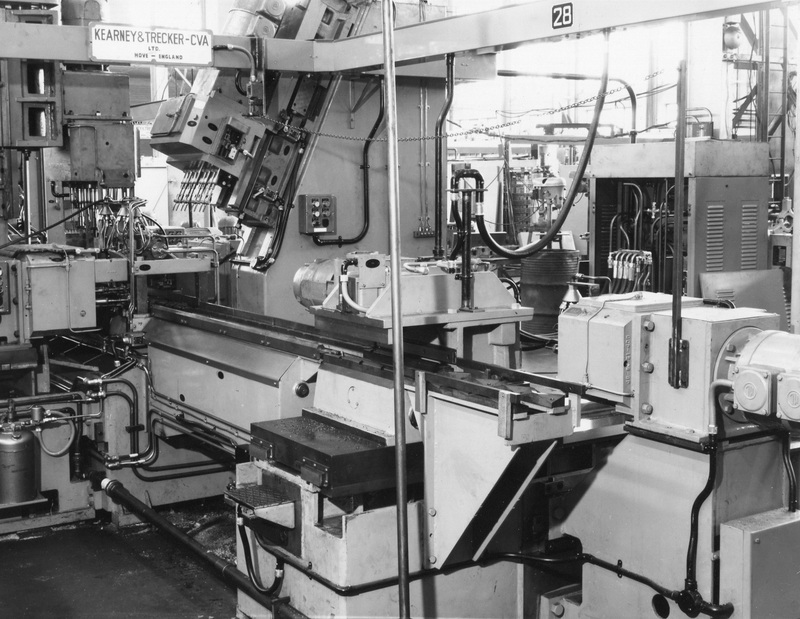 The machines were for the production of rear axles and differential housings for large commercial vehicles. 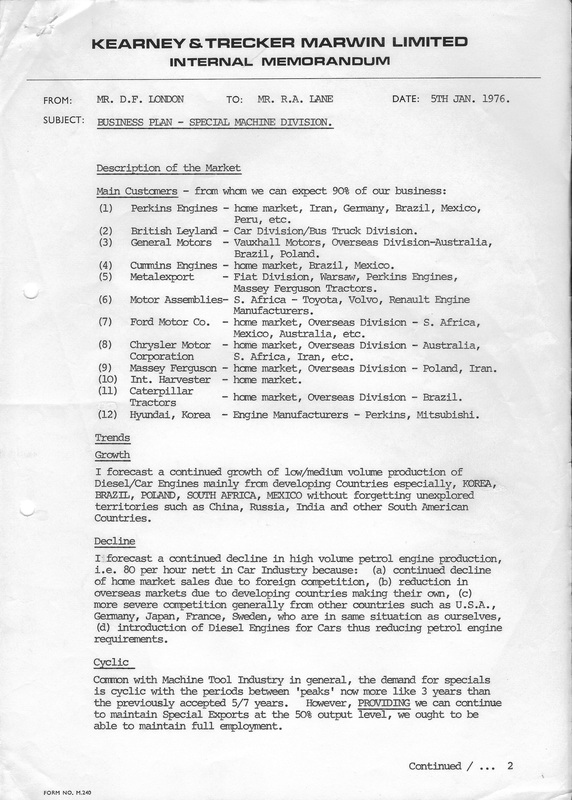 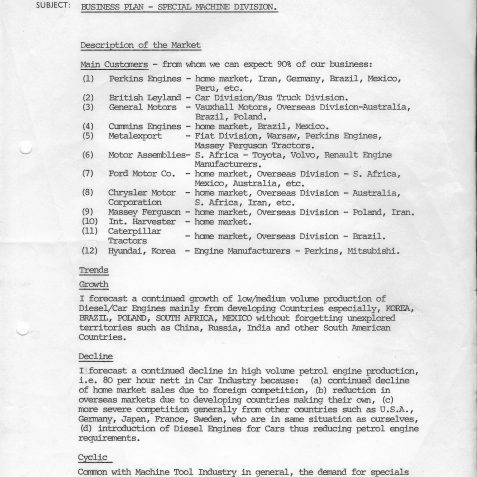 The Special Machine Division Business Plan for 1976, show the wide range of customers from all around the world from which orders were expected. 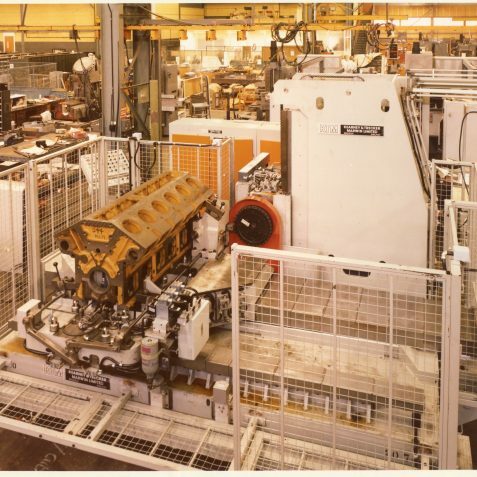 Derry London’s report forecast a growth of business from developing countries, and the introduction of diesel engines for cars, thus reducing petrol engine requirements. 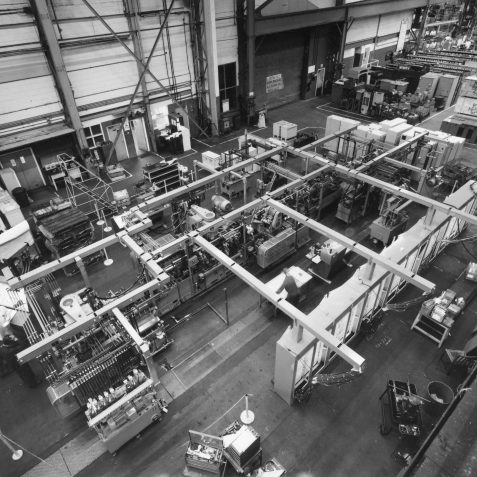 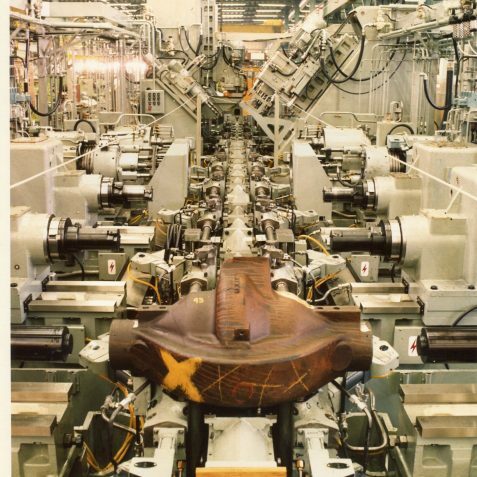 Worldwide sales of Special Purpose Machines was anticipated to reach £50m, and the Company expected to win between £4m – £5m, around 10% share of the market. 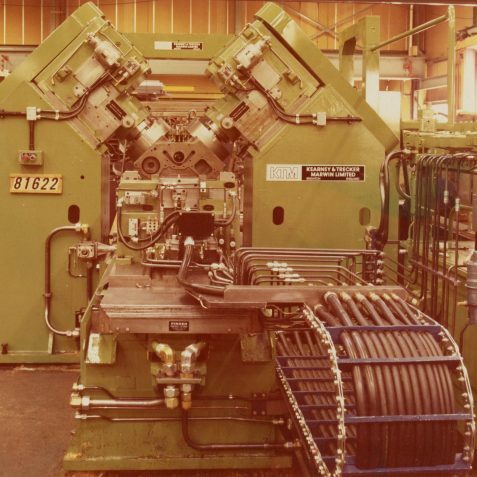 I worked on this machine in the mid 1970s. 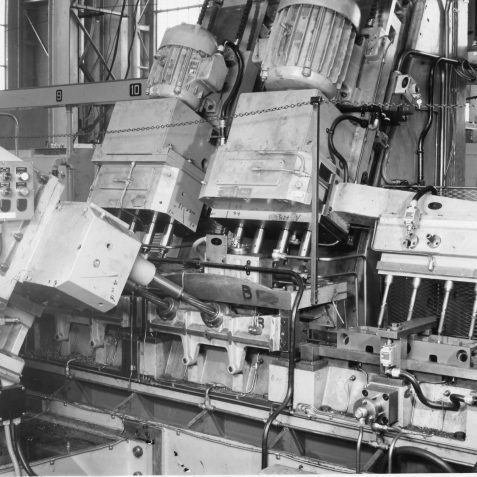 The man standing at the control panel is the foreman Mo Porter.